For those with a big backyard space, the great looking X Stream 2 Inground Swimming pool slide is a reasonably-priced good quality slide by Interfab. 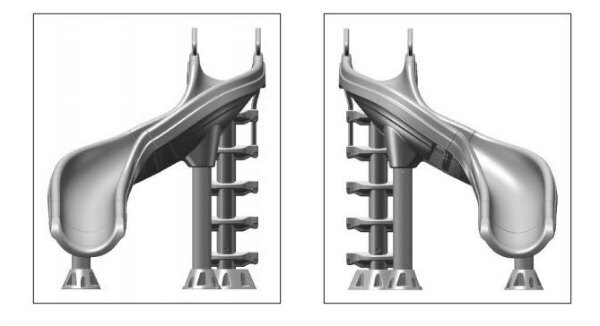 This is a fun slide with a 2-turn ride that provides lots of fun for both kids and adults. The X Stream 2 is a big slide. It stands 6′ 6″ and requires a deck space of 14′ 0″ x 8′ 6″. The flume makes two different turns and measures 22.5″ wide and 12.5″ deep. This gives it enough protection for the person who is sliding down its high deep walls. The Interfab X stream 2 pool slide turns right or left (choose which one depending on your pool and deck space) and is available in summit gray color. It is made of durable, impact-resistant space age plastic material. The flume, steps, rails and leg supports are rotational molded Polyethylene Construction. It also has stainless steel hardware. The water supply system flows at 15 – 25 gpm. The water outlet, located at the very top of the flume stops a person from being stuck or not sliding down to the pool. The Steps/Ladder: There are 5 steps to the seating area/deck at the very top. Each step has slip-resistant treads to prevent slip-throughs. The handles also have grip-around handrail for safety and security. Here are some pictures of the X-stream 2 Pool slide. These pictures should give you a clearer view of what this pool slide looks like outdoors. Here are our recommended places to buy X-stream pool slide at the best price. Our sponsors below offer some of the best online deals when it comes to any pool products and accessories. Just check them out and see for yourself. Here’s a step by step installation video on how to assemble the X-stream swimming pool slide. 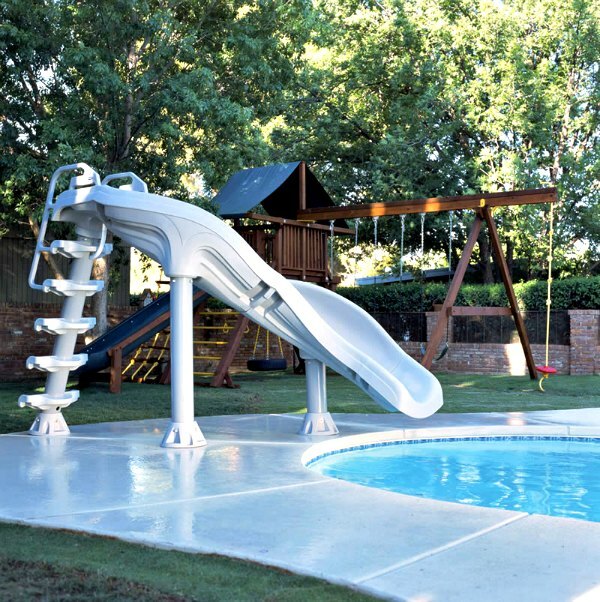 This does not however include the necessary dimensions that your pool and your deck space needs to have for the safe installation of this slide. Please refer to the installation manual which comes with the package for this. If the Interfab X-Stream isn’t what you’re looking for, check out other swimming pool slides featured in this site.